EFFECTIVE EDUCATION: Utilizing the study methods of L. Ron Hubbard, grassroots programs in communities around the world have achieved remarkable results. or Bobby, things went down, down and finally struck bottom  on the concrete pavement of skid row. He lived on the street, with no job and no one to turn to. Addicted to drugs and alcohol, almost all the money he could find or earn went to support his habit. Underneath his problems, he was illiterate. He detested the life he was trapped in, but saw no alternative. But then, almost by accident, he found his way out. He heard about a program being run in a neighborhood church, and enrolled in it. It wasnt religious studies or a 12-step program. It was something which enabled him to read and write  skills he desperately needed to get a job and regain self-esteem. Everything in his life began to change. He improved his reading and comprehension skills to college levels, applied for job training and was accepted, cleaned up his lifestyle and found a place to live. He has a future today, thanks to the revolutionary educational breakthroughs of L. Ron Hubbard. At the root of educational failure lies a fundamental situation almost universally overlooked: Students are thrown into subjects without being taught how to go about learning. As they grow older, they are confronted by more complex areas of study  still without ever having learned how to learn. Mr. Hubbard recognized the failings of modern education in 1950, long before horror stories of scholastic deficiencies began to make headlines. His investigation into the problems of teaching others led to a breakthrough  the first comprehensive understanding of the real barriers to effective learning. From this, he developed precise methods on how to learn any subject  methods that ensure a person will not only grasp what he is studying, but be able to apply what he has studied in work or in life. These methods came to be known as study technology, and provide the first workable approach to teaching people exactly how to learn. The word technology was used because the same methods themselves can be applied  like a tool  to facilitate learning any subject. Study technology opens the door to effective training and makes it possible to raise the general quality of education to new heights. Mr. Hubbard found that three barriers to study exist. He discovered how they can arise and developed methods to overcome them. Study technology includes tools that enable the student to deal with any obstacle to full comprehension. It includes effective methods for isolating and clarifying those parts of any text or subject which were not fully understood and principles which address the correct use of dictionaries, grammar and communication. REV. ALFREDDIE JOHNSON, REV. FRED SHAW AND ACTRESS ANNE ARCHER: Helping to spread effective education methods. 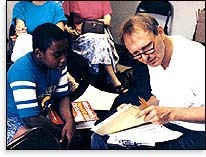 Bobby, mentioned above, attended a literacy project in Compton, California, administered by Applied Scholastics International and the World Literacy Crusade which utilizes the educational methods of Mr. Hubbard. Applied Scholastics International is a nonprofit organization supported by members of the Church of Scientology. It is dedicated to improving education worldwide. With international headquarters in Los Angeles, it has offices throughout the United States and the world. In countries as diverse as Canada, Mexico, the United Kingdom, France, Denmark, Sweden, Germany, Austria, Australia, Malaysia, Russia, Venezuela, China and South Africa, millions have gained literacy and improved study skills through Mr. Hubbards study technology by means of Applied Scholastics programs. For decades, results from study technology through Applied Scholastics have been sweeping and beneficial, and the number of educators, companies and government agencies that utilize and endorse it has steadily grown. Study technology opens the door to effective learning and makes it possible to raise the general quality of education to new heights. Take the case of a formerly homeless man who was unable to hold a job. After completing the World Literacy Crusades program in Compton, he returned to school, studied to become a nurse, and passed his accreditation examinations with exceptionally high scores. By application of the study technology, the World Literacy Crusade produces educational miracles. Giving students the ability to learn helps to curb the drug abuse and crime which arise when people have the doors to learning closed to them. 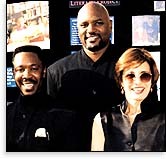 The World Literacy Crusade formed in 1992 in the wake of civil unrest in Los Angeles earlier that year. Compton had been hit hard by the destruction. Galvanized into action by the looting and criminality that had ravaged their neighborhood, a group of clergy in Compton, headed by the Rev. Alfreddie Johnson, a Baptist minister, decided to change conditions so that this chapter of history would never repeat. They resolved to dig out the social decay which lay underneath the riots: illiteracy. Assisted by Applied Scholastics International, Rev. Johnson formed the Compton Learning and Literacy Project, where children and adults receive free tutoring and training in literacy, study and communication. And out of that program, the World Literacy Crusade was born. Many inner-city youth, homeless and gang members have since completed the program and are now leading productive lives and contributing to the community. Based on its results in Compton, World Literacy Crusade projects are now operating in Santa Ana, California; in Harlem and Brooklyn in New York; in Boston, Miami, Columbus and Seattle  and in other cities as far away as Sydney and Melbourne in Australia, and Auckland, New Zealand. While grassroots programs in inner cities and underprivileged areas around the world have had remarkable results, enormous success has also come from Applied Scholastics programs in schools and tutoring. In a project in Brixton, near London, England, 8- to 13-year-old students were put through a course in reading skills based on study technology which focused on finding misunderstood words in their studies. Each student spent eight to ten hours over ten days doing the course. Based on standard tests, the students who went through this course gained an average of 1.3 years in reading age. A control group comprised of students who werent put through this course dropped in reading level. A Los Angeles study showed an average gain of 1.8 years in vocabulary and comprehension after only 10 hours of tutoring in study technology. A study in Arizona showed an average gain of two years in comprehension and vocabulary among those who participated in school programs where study technology was used. In South Africa, a class of underprivileged high school students trained in study technology achieved a 91 percent pass rate on the countrys Department of Education examination at the end of the school year, a marked improvement. Statistics such as these translate into effective education and an assurance that young people can grow up to confident, self-reliant adulthood with learning skills they can use every day of their lives. Testimonials from those who have witnessed the results of Mr. Hubbards study technology attest to its effectiveness in helping people learn how to learn and to be more successful in life. Today Hayes serves as international spokesperson for the World Literacy Crusade. Others, including Anne Archer and John Travolta, have donated time and energy to the program so that it can help more and more of those who have found real learning inaccessible. Each has seen the results of the study technology firsthand and remarked how much they want to see everyone benefit from it. Applied Scholastics and its affiliated programs and schools have brought a brighter future to the world of education. For more information, write: Applied Scholastics International, 7060 Hollywood Boulevard, Suite 200, Los Angeles, California 90028. Phone: (323) 962-2907.